People generate large quantities of solid waste on a daily basis. In the United States, the average human waste generated is about half a ton per person per year. In other words, a city or county with a population of about 1 million will generate 500,000 tons of waste annually. Proper management of this huge amount of waste is a significant and important challenge for municipal governments. Landfilling waste is one of several disposal options and is often the most cost-effective. Rick Blankenship, an engineering technician, monitors the gas collection system at the I-95 landfill, in northern Virginia. The gas collected here replaces other fuels used to heat a nearby pollution control plant and the landfill maintenance building. All photos by Wayne Blake-Hedges. Sanitary landfilling of waste began sometime in the late 1960s or early 1970s. Today, more than 3,000 active landfills serve more than 39,000 U.S. county and town governments, and more than 10,000 landfills are closed nationwide, according to estimates from the Environmental Protection Agency (EPA). About half of the active landfills will remain open for 10 or more years, and the industry trend is for fewer and larger landfills to meet regional waste disposal needs. By design, landfills are a large stationary mass of waste, often exceeding several million tons. The waste naturally contains biodegrading organisms that help to decompose it and produce landfill gas, which is a mixture of methane (a combustible gas) and carbon dioxide. According to EPA, municipal solid waste landfills are the largest human-generated source of methane emissions in the United States. Approximately 400 landfill gas-to-energy projects are currently in operation in the United States, including the Fairfax County I-95 landfill in northern Virginia, which provides a good example of some of the benefits and challenges associated with such systems. The gas captured from these projects can fuel a variety of energy systems, including internal combustion engine generators, boilers, combined heat power systems and radiant heaters. Landfill operation and management can be grouped broadly into three phases: active, closure and post-closure. During the active phase, landfills are built in increments called cells. Each cell has a liner system to protect groundwater. Trucks (or sometimes railcars or barges) bring waste into the landfill, where the trash is weighed, unloaded, and spread and compacted. A daily soil or temporary cover over the landfill controls odors, promotes stormwater runoff, and reduces the potential for rodents and flies. During the closure phase, the landfill is graded and capped. The cap consists of clay or a synthetic cover, drainage components, soil and vegetation. Various federal and state agencies maintain and monitor the landfill for 30 years after closure. Included in the monitoring is landfill gas migration, which is controlled by installing an extraction system for the gas. Landfill gas subsurface migration, surface emissions and odors pose public health, safety and environmental concerns, as the gas is composed of approximately 50 to 60 percent methane, 40 to 50 percent carbon dioxide, traces of odorous compounds and several hazardous air pollutants. Subsurface migration of landfill gas outside of the landfill itself would occur without proper planning and design of the site. Landfills lined with a membrane (which include most modern facilities) offer greater resistance than the usual clay liner to movement of the gases, as the liner is impervious. Subsurface migration of landfill gas can lead to seepage into buildings, sewers, manholes and other areas, potentially resulting in an explosive mixture of oxygen and methane. By 1985, EPA had documented more than two dozen landfill gas-related explosions. These incidents date back to 1969, when an explosion at the National Guard Armory in Winston-Salem, N.C., resulted in the deaths of three guardsmen and serious injury to 12 others. Uncontrolled surface emissions can lead to air pollution and offensive odors, which is why landfill air emissions are regulated under the Clean Air Act. The regulated pollutants include non-methane organic compounds and hazardous air pollutants. Although not regulated as a pollutant, methane is both explosive and a greenhouse gas with a global warming potential 21 times greater than carbon dioxide. In addition to lining a landfill, landfill gas migration can be controlled by gas extraction systems. Such extraction and thermal combustion effectively destroys methane, as well as the non-methane organic compounds and hazardous air pollutants. In addition, combustion destroys odorous compounds such as hydrogen sulfide contained in landfill gas. Fairfax Countys I-95 landfill is 500 acres in area and operates under a permit issued by the Virginia Department of Environmental Quality. Landfilling of waste began in 1972 and ended in 1995. Within this period, approximately 22 million tons of waste accumulated there. According to estimates, this amount of waste probably produced more than 8,000 standard cubic feet per minute of gas at its peak period from 1991 to 1993 and between 4,000 and 8,000 standard cubic feet per minute of gas for about 15 years (1985 to 1990 and 1994 to 2003). The landfill is currently generating more than 3,000 standard cubic feet per minute of gas. The I-95 landfill gas collection system, like other such systems, has several extraction wells spread throughout the site to harness the gas. 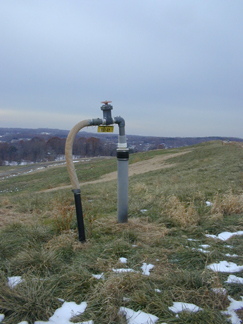 Like most landfill gas collection systems, the I-95 landfill has a series of horizontal and vertical extraction wells that are spread throughout the landfill. Because landfill gas is saturated with moisture, condensate builds up in the pipes. The pipes are, therefore, graded to allow movement of condensate toward the lowest points in the system. Traps collect it from landfill gas and keep the pipes free from moisture. Valves check extraction rates from various wells and balance them in a way that results in minimum landfill gas migration and air intrusion. The landfill gas collection system at the I-95 landfill consists of more than 300 extraction wells. The types of waste stored at the landfill are very diverse, and thus the gas extraction rates between wells vary. A 1-megawatt electric power plant working on an internal combustion gas engine needs a sustained flow of about 350 standard cubic feet per minute of landfill gas. Currently, two plants utilize 2,300 cubic feet per minute of gas, each generating 3 megawatts of electricity for direct resale to a local energy utility. A third facility cleans, dries and compresses the gas for transport to the countys wastewater treatment facility, just a few miles away, for sludge incineration. The amount of gas utilized at the wastewater treatment facility varies, ranging from 300 to 1,400 cubic feet per minute, depending on the sludge load and moisture content. In addition, landfill gas is utilized at the landfill to heat the equipment maintenance facility. The landfill gas extraction system in Fairfax County started in 1989, to keep landfill gas from migrating offsite to a neighboring prison complex (Lorton Youth Center) and for future beneficial use of the gas. The original 27 exterior passive vents were converted to extraction wells, including seven interior extraction wells. The seven interior wells were meant to serve as enrichment wells, to ensure that the gas composition had enough methane to allow the gas to be burned in an incinerating flare. On startup of this system, the flow of gas was considerably greater than anticipated, with flows averaging 700 to 900 cubic feet per minute. The county awarded a contract for landfill gas utilization to Michigan Cogeneration Systems, Inc. (Michigan Cogen), in 1990, when it began construction of its first landfill gas-to-electricity plant. The plant went online in December 1991. This first plant utilized 1,150 cubic feet per minute of landfill gas to generate 3 megawatts of electricity for direct sale to Dominion Virginia Power, the local electrical utility. The plant houses four generator units, each capable of producing 800 kilowatts of electricity. Approximately 200 kilowatts are used by the plant, leaving a 3-megawatt net output. Subsequently, the I-95 landfill began expanding its landfill gas collection system and piping to deliver gas to the new landfill gas-to-electricity plant. In 1992, Michigan Cogen began constructing a second 3-megawatt electrical generation facility. This plant became operational in January 1993, and is essentially identical to the first plant. Like the first, it is also solely fueled by landfill gas. This system consisted of 75 additional interior landfill gas extraction wells, 22 horizontal collection trenches and collection piping. In May 1997, Michigan Cogen began operating its third landfill gas utilization project. This facility compresses the landfill gas into 10 pounds per square inch, removes the majority of moisture and then delivers the dry gas to the Noman Cole Pollution Control Plant for use in sludge incineration. In an afterburner process, the gas cleans up the emissions from sludge incineration. 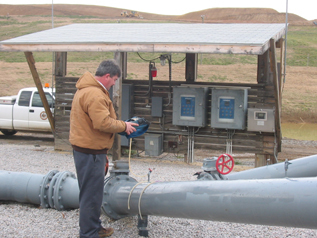 This landfill gas replaces natural gas previously purchased from Washington Gas. Instead, pipelines deliver gas directly from the I-95 landfill to the Noman Cole Pollution Control Plant. Landfill gas utilization by the pollution control plant is extremely variable and is based on the amount of sludge incinerated and the moisture contained in the sludge, but averages between 300 to 1,400 cubic feet per minute. In March 2005, five standard natural gas infrared heaters were retrofitted and installed in the maintenance building of the I-95 landfill. These units replaced two existing propane-fired forced air heaters and tapped the existing pipeline that delivers landfill gas to the Noman Cole wastewater facility. A simple treatment system was installed to remove any remaining moisture and contamination. After treatment, the gas is delivered to the heaters through a stainless steel piping system. The radiant heaters use a maximum of 30 cubic feet per minute of landfill gas. Using landfill gas for energy is a win-win opportunity. Landfill gas utilization projects involve citizens, nonprofit organizations, local governments and industry in sustainable community planning, and they create partnerships. These projects go hand in hand with community and corporate commitments to cleaner air, renewable energy, economic development, improved public welfare and safety, and reductions in greenhouse gas emissions. Directly using landfill gas to offset the use of another fuel (natural gas, coal and oil) is occurring in about one-third of the currently operational projects. This direct use of landfill gas can be in a boiler, dryer, greenhouse or other thermal applications. Innovative direct uses include firing pottery and glass-blowing kilns; powering and heating greenhouses and an ice rink; and heating water for an aquaculture (fish farming) operation. Industries currently using landfill gas include auto manufacturing; food processing; pharmaceutical manufacturing; wastewater treatment; consumer electronics; and paper and steel production, just to name a few. Generating energy through the landfill gas projects provides many environmental benefits. The projects assist in destroying methane, a potent heat-trapping gas, and offset the use of nonrenewable resources such as coal, natural gas and oil. They help reduce air pollution, and the landfill gas emitted from decomposing trash is a reliable and renewable fuel. The benefits from the I-95 landfill project are approximately equal to any one of these: removal of emissions equivalent to 50,000 vehicles, planting 72,000 acres of forest, offsetting the use of 1,300 railcars of coal or powering 3,800 homes. The technology is also cost-saving. The savings in fuel costs are approximately $500,000 annually from the landfill gas use at the Noman Cole Pollution Control Plant and $5,800 from use of landfill gas for heating the maintenance building at the I-95 landfill. Riat, a professional engineer, is chief of the I-95 Landfill Complex in Fairfax County in northern Virginia, and has 20 years of experience in construction and management of sanitary landfills. Blake-Hedges is senior engineering technician for the I-95 Landfill Complex, and has 16 years of experience in construction, operation and maintenance of landfill gas systems. Peterson, a professional engineer, is vice president of SCS Engineers and has 20 years of experience in designing landfill gas systems.